Four Microsoft Certified Technology Specialist (MCTS) certifications on Windows Server 2008 demonstrate an IT professional's in-depth, current skills on Active Directory, network infrastructure, applications infrastructure or System Center Virtual Machine Manager 2008. Earn an MCTS certification so that you can be recognized for specialized technical knowledge and stand out to hiring managers as ready to excel in a Windows Server 2008 environment. 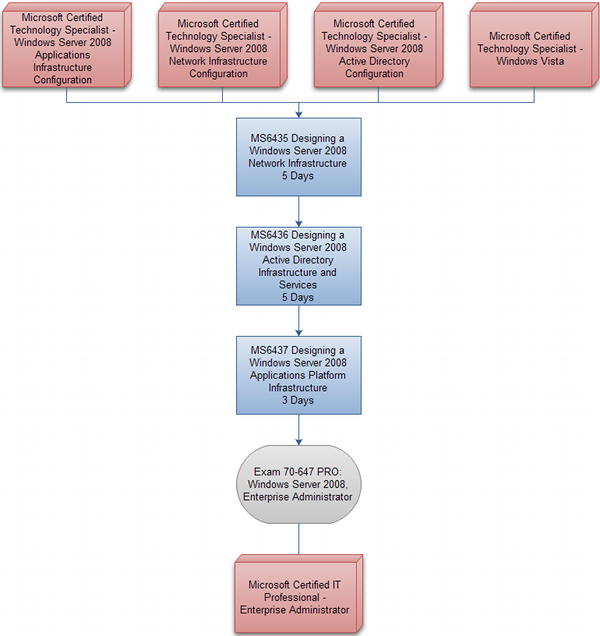 The MCTS credentials give you access to the MCP community and benefits such as a personal profile on Microsoft.com and access to the Microsoft Knowledge Base. Candidates for this MCTS certification are IT professionals who are working with Windows Server 2008, or anticipate deploying or working in a Windows Server 2008 environment within the next year. Candidates typically work in a large or enterprise organization. Each MCTS certification requires one exam. Please click on the boxes in the diagrams below to be taken to the relevant course outline. 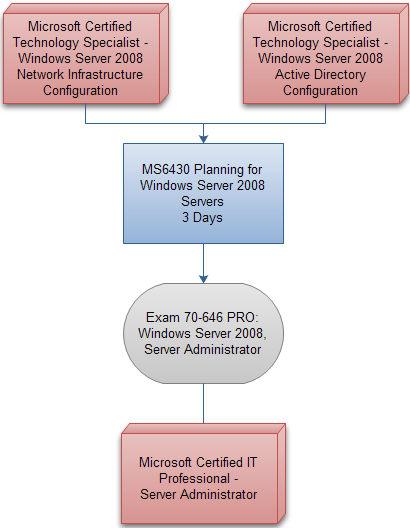 Server administrators are recognized among their peers and managers as leaders in the day-to-day operations management of Windows Server 2008. Demonstrate and communicate your ability to take system-wide ownership of Windows Server 2008 administration, and increase your organization's return on technology investment, by earning the MCITP: Server Administrator certification.